Model meaning someone who shows off a product. And in this case, Vice-President hopeful Sarah Palin has become a model for Japanese designer Kazuo Kawasaki – albeit unintentionally. 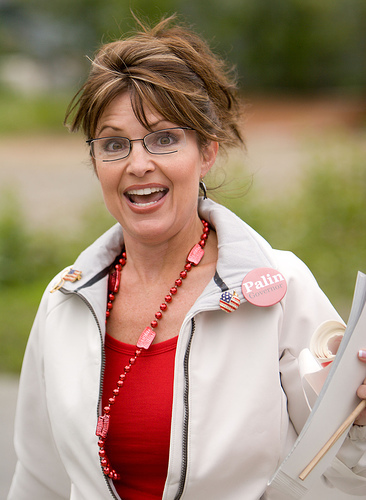 We have all seen Sarah Palin – she is on TV every single day – and I am sure that you have also noticed her fashion sense, including the eyeglasses that she wears constantly. If you have found yourself wondering where she got those glasses, then wonder no more. They were designed and made by Kazuo Kawasaki. Dubbed the MP-704, these glasses are made of titanium, known to be ultra light and hypoallergenic. In fact, these kinds of rims have been in the market for many years now but ever since Sarah Palin came into the limelight, more people have become aware of them. As for Kawasaki, he is enjoying thousands of orders from all over the world because of the exposure that Palin brought to his product. If you are wondering if having Sarah Palin as a model is a good thing or not, take a look at these figures. Kawasaki says they normally make about 12,000 units of the MP-704 over an 18-month period. In the last 10 days, however, their orders have soared to 9,000 – with most of the customers coming from the United States! Political beliefs not withstanding, I am tempted to find myself a pair of these glasses as well. They do look good and with the quality that they are supposed to have, it wouldn’t be such a bad buy.